In today’s world we are very concerned with recycling, reusing, and preserving the environment. However, not everything that looks like it could be recycled can be! This includes medical waste. Not only can these materials not be recycled, but they also need to be disposed of differently depending on the kind of waste. Use this how-to guide to learn the process for disposing of various kinds of medical waste from leftover medicine to medicine dispensers, and medical devices. Before we get to the how-to, we should spend a little time understanding why everything cannot just be recycled, thrown away, or flushed down the toilet. Let’s think about recycling first. Recycling used plastics such as syringes or needles runs the risk of introducing diseased bodily fluids into products we will use again. Now on to throwing medicines away. Some medicines are dangerous such as chemotherapy and others can be used by people with a drug dependency. We will learn what can and cannot be thrown away. Finally, flushing medicines down the drain does not eliminate them from the water supply. Water cleaning plants do not typically remove these medicines from the water supply. In a previous blog post, we looked at disposing medical facility sharp medical waste. Similar methods can be applied to household medical waste. Securely wrap all sharp medical waste. This prevents potentially contaminated materials from puncturing the bag they are placed in. 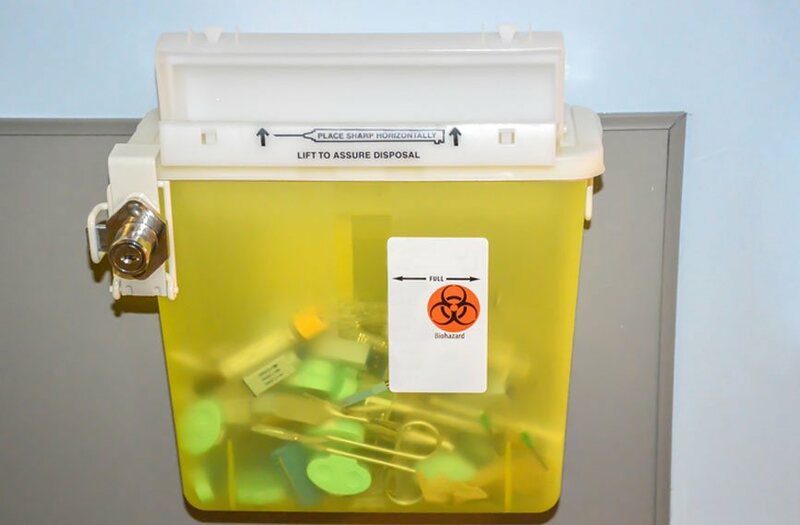 Place these materials securely in a bio-hazards sharps container. Only fill the container to the fill line. Filling the container past this line can lead to improper shutting and possible injury or contamination. Take another bio-hazards container home for future collections of sharp waste. There are a few different options for disposing of medicine. All medicine is available to be returned through the medicine take-back programs. These programs typically have announced weekends where collection sites will collect all unwanted medicine. If you have medicine that needs to be disposed prior to a collection date, you can contact your local medicine waste facility and find out your options. These options can include a mail-back program or going to an authorized collection site. If you do not take your medicine to a collection site, then read the label. Some medicines will have very specific directions for how to properly dispose of them. If this is the case, follow the directions on the package. If you do not take the medicine to a collection site and the medicine does not have specific directions for disposal, then you can secure it in your trash. Secure the medicine in a plastic bag with coffee grounds or kitty litter. Throw this plastic bag into the trash. If there is personally identifiable information on the bottle, scratch this out before throwing it away. The final option for disposing of medicine is to flush it down the drain. We discussed in the beginning of this article that this can introduce medicine into our drinking water. While this is true, some medicines need to be flushed. Most medicines that need to be flushed are powerful pain medications that can cause overdoses in very small amounts. The final type of medical waste that needs to be disposed of properly is medical equipment. This equipment runs the gamut from casts to I.V. bags and from catheters to incontinence items. To dispose of these items follow the steps here. 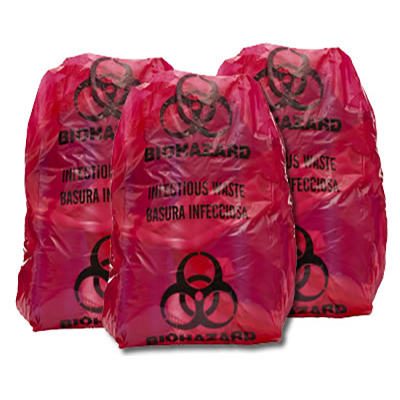 Double bag all medical equipment waste in large black garbage bags. Place these bags in your sealed garbage can. This is especially important because these scents can be attractive to animals. 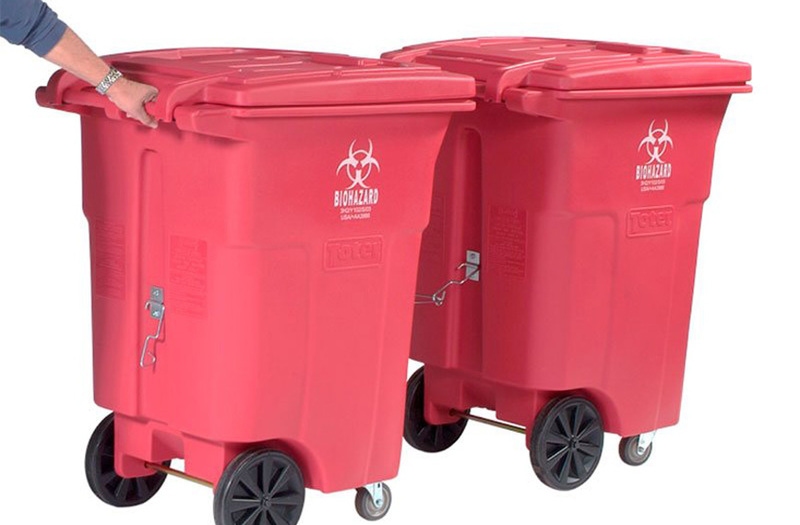 If you do not have a large enough garbage can, you can contact your local medical waste collector and they will work with you to find a solution.